In the land of vape tricks, perfect o’s, and the infamous jellyfish, comes VGOD — a crew of tricksters that’s taking the word “vape” to a whole new level. Backed by experienced cloud pushers, VGOD offers up some of the dopest products on the market, with their latest being the VGOD Trick Tank. Below we’re going to give you a preview of the Trick Tank, and we’re going to be giving away 10 of them so that you’ll have your trick game on point, and ready for the big leagues! Note: This giveaway is sponsored by our good friends at AtomVapes.com. The VGOD Trick Tank is one incredible looking sub-ohm tank. It offers a short stature with a simplistic design, making it an outstanding site to look at, and an even better one when it’s used to top off your most precious mod. The Trick Tank is towered by a Delrin Heat Resistance Drip Tip, eliminating burnt lips, while the body of the tank is constructed of durable stainless steel, pyrex glass, and delrin components. The Trick Tank by VGOD was truly built for performance! It stands just 48mm tall, only 24mm in diameter, and offers up a minor 38g when it comes to its weight. This is certainly a small tank that will give you that stealthy look that’s trending, but it’s backed with features that make it a top performer. It features a 3mL e-liquid capacity, an easy to use top fill design, and boasts a large airflow inlet that prevents the Trick Tank from overheating. What’s most impressive about this little monster of a sub-ohm tank though, has to be its coil options. It comes included with a 0.2Ω and a 0.5Ω TTC Parallel Kanthal coil. These coils not only provide a low resistance, but they also provide great flavor, reliability, and performance for those clouds tricks that you’re looking to take to the next level! Wickin and Trickin all day son! Our good friends at Atom Vapes are distributing the VGOD Trick Tank, and they wanted to share some of the love with Guide To Vaping viewers. 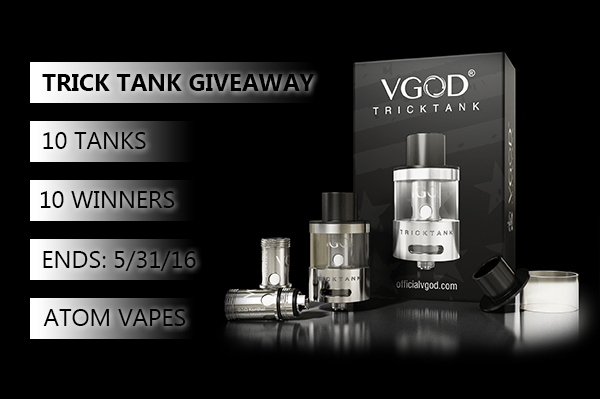 Atom Vapes is giving away 10 VGOD Trick Tank’s so that you can put your skills to the test! INFO: Don’t feel like waiting for giveaway results? Purchase the VGOD Trick Tank from Atom Vapes! Is there a link for the giveaway? Thanks for the chance! This tank would look GREAT sitting on my Psyclone Evo DNA200! Look forward to the tank hitting the market. 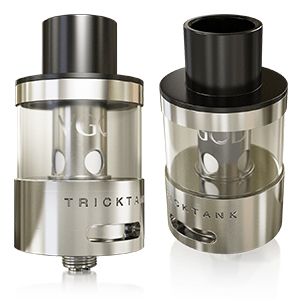 The Tricktank should be the next hard hitting and hugely popular option for both cloud chasers and sub ohm loves alike. Looking forward to this tank! Many thanks for a great contest! Looking forward to seeing this tank! Thanks for the giveaway, looks like a great tank!!!!!! I’d like to try this new tank! I will take one, but I guess I don’t qualify because I work here..
That’s a sweet looking tank. Wow looks like a well built tank!! Awesome giveaway! Good luck to everyone, hopefully a little extra luck to me! What all do you have to do for this giveaway. Nice! This is perfect for my VGOD Minikin Mod! this would be a great win wow!! the black one looks killer… as soon as I seen this tank, I wanted it. hey what do i have to do to enter the givaway, and when is the deadline? I definitely need this tank. Just because….vape and stuff. You know. Thanks for the opportunity. “Vape On and Vape Strong”. Is this where we enter the giveaway? If so, than thanks!!! Thanks for the chance! Atom Vapes does it again! I’m really hoping to be the lucky 10. Thank you for this opportunity! Yikes! I didn’t realize I put the 31st. For some reason I was thinking it was the 25th. No worries, I’ll have more giveaways coming up soon. This tank looks amazing. Thanks! I won the vgod trick tank giveaway!! This giveaway is over. Sorry. I’d love to win this and give it to my mom. Thanks. Is The Wismec Theorem RTA Worth The Hype?